Looking east on Bank St., Wallace, ID. I never met Ron Garitone, the late mayor of Wallace, Idaho. 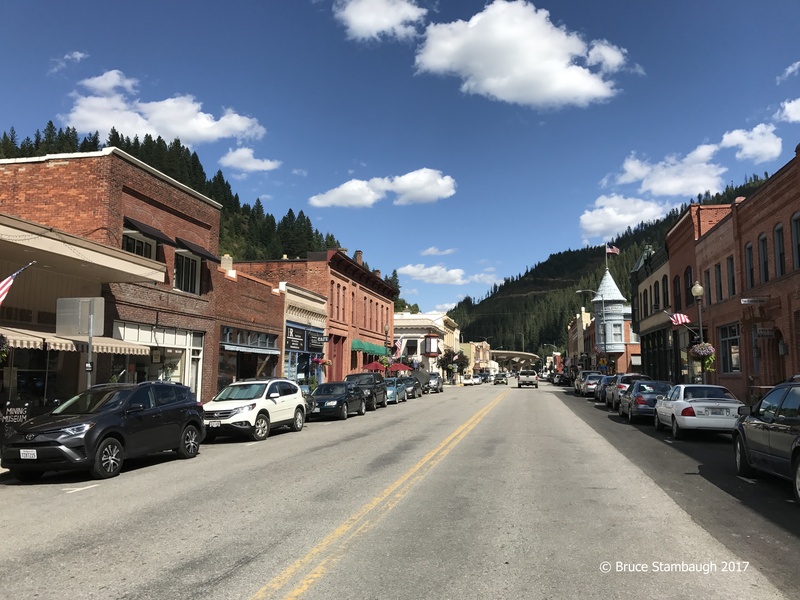 I’m sure I would have liked him if only based on one creative decision he made for his small mining and timber town located in Idaho’s panhandle. Pushed on an environmental issue by the EPA in 2004, the mayor was told, “If a thing cannot be disproven, it is thereby proven.” The incredulous but affable mayor called the government’s bluff. He proclaimed his beloved Wallace the Center of the Universe because his claim could not be disproven, he said. His proclamation gained international attention. 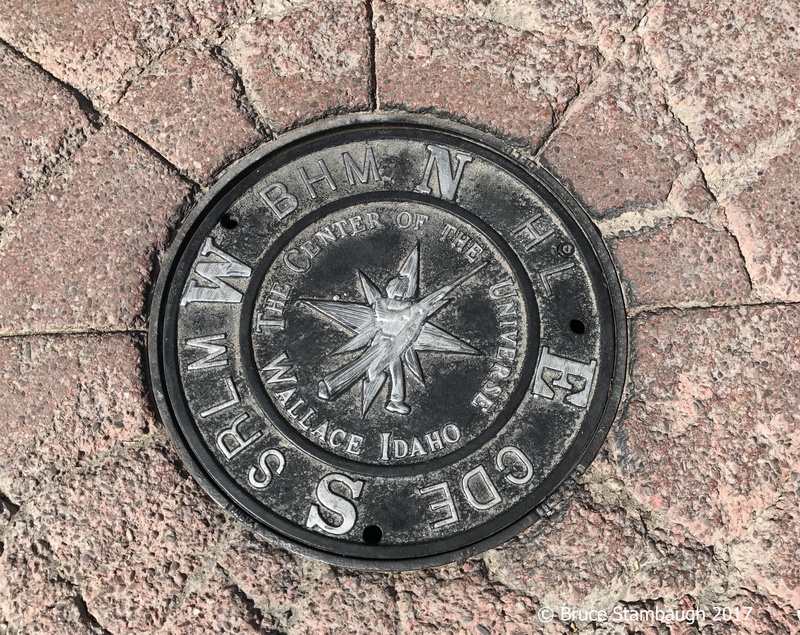 Wise town leaders seized on the idea and installed a fancy manhole cover that doubles as a marker in the middle of the main intersection declaring Wallace as the center of the universe. Blue and white tourist signs mark the spot. The proof is in the manhole cover. As I stood there admiring the designation with no fear of the typically light traffic, I flashed back to my early Holmes County, Ohio days. Impressed with its rural location and horse and buggy prominence, people who visited us, including several of my family members, asked me why we lived there. I had a ready answer for them. I was joking of course, much like the good-humored mayor. However, there was a grain of truth to the statement. Rural counties universally can’t offer all that their citizens need. Folks travel to more urban areas for entertainment, sporting events, doctors, shopping, and fine dining to name just a few. Sometimes everyday items can’t even be bought in the heart of Ohio’s Amish country. Specifically, it’s a fact that neither gasoline or alcohol can be purchased in either Saltcreek, Holmes County or Salt Creek, Wayne County. That point carries far beyond those two commodities. 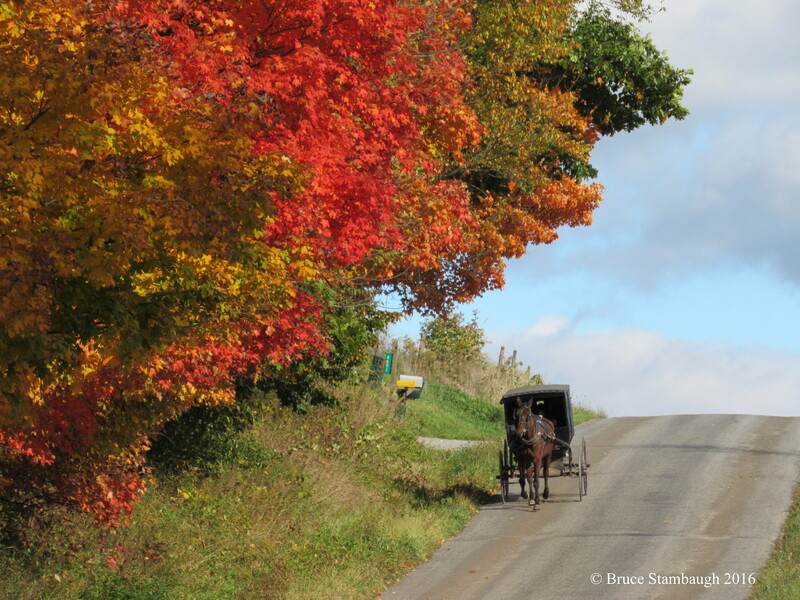 Autumn in Ohio’s Amish Country. Nevertheless, the faithful residences of the greater Holmes County area still love where they live. In my nearly seven decades of living, I’ve found that most folks feel the same way about where they reside no matter where they call home. Home is home. It’s all they need, sometimes all they know. As far as they are concerned, it is indeed the center of their universe. If we all feel that way, we can’t all be right. The truth is we all have bragging rights to that claim. Each of us is entitled to make that statement. But that does not diminish the other towns or peoples. I know that is true from having lived all of my adult life in Holmes County, Ohio, where I spent my most precious and productive years. To me, it was the center of the universe. It must have been. It attracted three to four million visitors a year. Now my view has changed, right along with my life’s purpose and priorities. I have a new center of the universe from which to operate. I can see it every time I walk to the mailbox, every time I travel down Pin Oak Dr. Mole Hill greets me, calls me, as it does so many others. Mole Hill is an ancient volcano now covered with dense woodlots, lovely homes, and fertile farm fields. Mole Hill is simply unmistakable and is the landmark by which all folks within its eyeshot navigate. 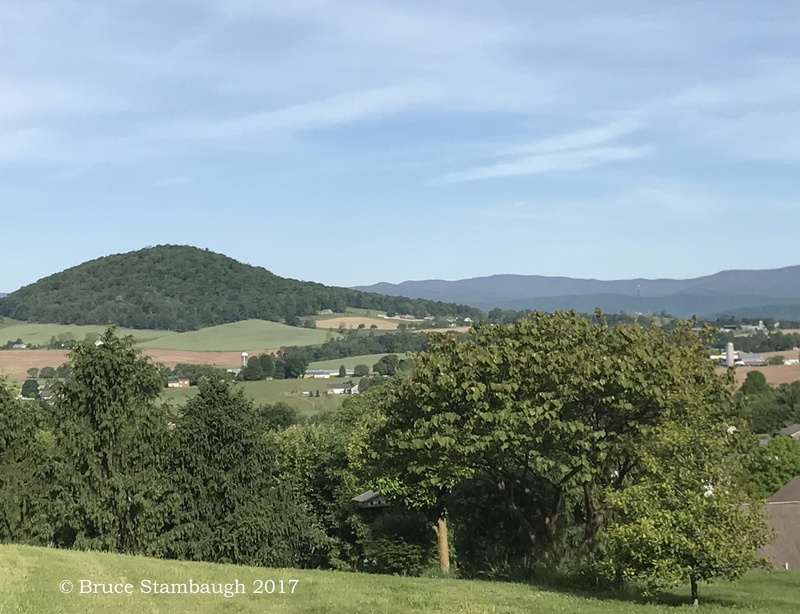 In western Rockingham County, Virginia, Mole Hill is the center of the universe. I dare you to prove otherwise. Mole Hill, Rockingham Co., VA.